The robot is designed for trading on a real account. Two channels are being built: Gilbert Raff and Chester Keltner. Raff's external channel allows you to determine the direction of the global trend. Inside it, in the Keltner channel, trading is carried out along the trend. Switchable martingale and money management are provided, deals are protected by stop-loss. The robot counts two channels. The outer channel is calculated using the Gilbert Raff method, and the Chester Keltner channel is embedded inside it. These channels respectively reflect global and local trends. The most effective and safe is the trade if the directions of the identified trends coincide. Entering the market and fixing profits are made near the borders of the internal channel. 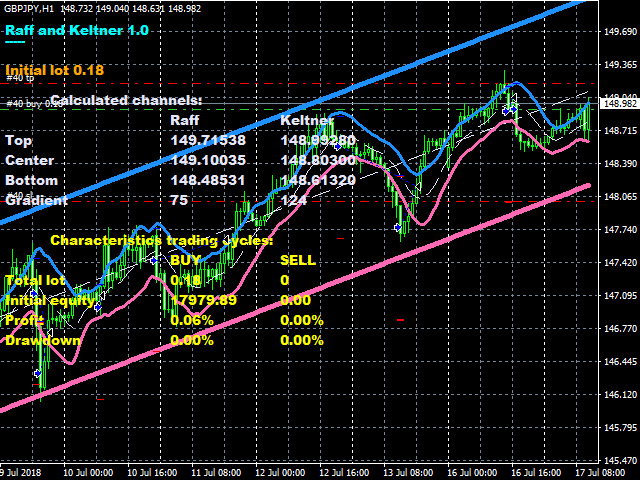 Positions are opened only in the direction of the trend determined by the external channel. Thus, most of the positions are closed with a profit. Unprofitable positions are averaged by additional transactions, which are calculated so that their totality is also closed with a profit. As the deposit increases due to money management, the volume of transactions increases to reconcile available funds, profitability and risk. Testing and application of the robot is shown in the video. 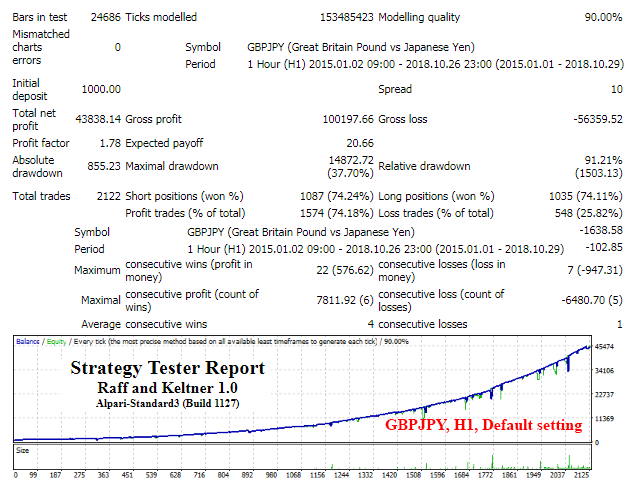 During testing in the period from January 2015 to October 2018 on the GBPJPY pair and the hour timeframe with initial capital of $ 1000 and with default settings, the robot made a profit of $ 43838. No indicators are required for the operation of the robot, all the necessary algorithms are contained in a single file of the robot. To control the operation of the robot, you can use the additional indicator Raff Channel indicator, which displays the Raff channel and the KeltnerChannel indicator, which can be downloaded from the comments page. Indicators can be set on the same chart with the robot. The parameters of the indicators should be set as the corresponding input parameters of the robot. By switching the parameter Open counter positions, it is possible to allow or prohibit the setting of opposite positions when fulfilling the entry criteria in the opposite direction. The resolution of opposite positions increases the total number of trading cycles and reduces drawdowns due to locking. The robot is easily optimized to work on other currency pairs and timeframes. I will tell you the features of optimization in a personal message. Distance to safety levels - distance to safety levels, points. Specified profit with averaging - given averaging profit, $ by 0.01 lot. Use money management - use of money management (Yes, No). Initial lot - начальный лот. The robot can be used on 5- and 4-digit quotes. The number of digits in quotes is defined automatically. All parameters specified in points should always be set for 5-digit quotes (set by default). The possibility of banning the start of new trading cycles on Monday and Friday has been introduced. For this purpose, the input parameters "Trade on Monday" and "Trade on Friday" are provided. Clarified the criteria for setting positions. Minor bugs fixed.